« *** WINNERS *** Karen and Aaron are Living the Life of Riley! CONGRATULATIONS! Personally, I consider shopping a dedicated skill that takes a great deal of patience, a keen eye and a wonderful sense of style. Of course, if you take shopping and bargain hunting as seriously as I do, then perhaps it could be equated to a sport, just like hunting or fishing. In order to bag the best game out there, you have to know which hunting grounds to frequent. This is where stores such as T.J. Maxx and Marshalls come in. They offer first quality, name brand merchandise for a fraction of the prices charged at high-end department stores. How are they able to offer you the exact same name brand merchandise for less? Their buyers are on the hunt over 40 weeks a year for the hottest items of the season. So when a designer overproduces and department stores overbuy, they swoop in, negotiate the lowest possible price, and pass the savings on. Also, because T.J. Maxx and Marshalls are constantly purchasing great merchandise, unlike department stores who buy seasonally, T.J. Maxx and Marshalls stores have thousands of fresh items delivered every week. So, the best shopping strategy is to pop in often. Recently, I popped in to the nearest Marshalls to see what big deals I could nab. Keep reading to find out what I bagged on my latest hunting trip! 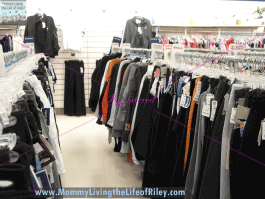 From the moment I waltzed into Marshalls, I had one thing on my mind...workout gear! Every New Year, I try really hard to institute a regular exercise routine into my schedule and always find myself needing a little inspiration to get going. I wanted to find some really cute and versatile exercise clothes which would look great while working out, playing with my daughter or running errands. I was thrilled at the large selection of name brand gear that Marshalls had. Just look at the racks of clothing I got to pour through in order to find the perfect exercise outfit. Personally, I love delving into large racks like these, for you never know what treasures are there waiting for you! Of course, it never fails that I always find plenty of deals which weren't on my shopping list. 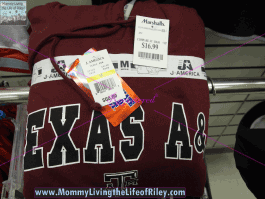 Just look at the Texas A&M officially licensed hoodie sweatshirt/thermal shirt combo pack shown here. It has an original $60.00 price tag on it, but Marshalls is selling it for only $16.99! I couldn't even buy one shirt like this for $16.99 anywhere else, but at Marshalls, I can actually get TWO for this low price! I was also tempted to buy some new workout gear for my Wii and even some new workout videos. 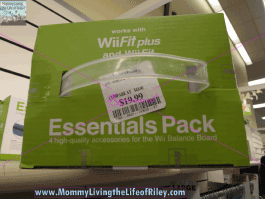 As you can see from the pictures shown above, this Wii Essentials Pack regularly sells for $43.00, but Marshalls has it for only $19.99. This would make a terrific gift for a friend or family member that is trying to get in shape, or for a new mom who would love to get their pre-baby figure back. 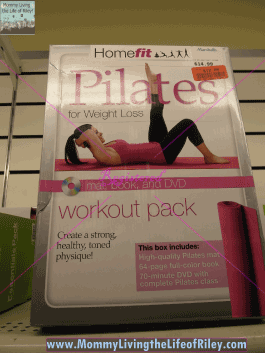 I was also shocked to find an entire Pilates workout pack, including mat, on CLEARANCE for only $12.00! Now that's a terrific way to get lean and toned on any size budget. Well, you may be wondering what I actually did purchase. I am thrilled to show you the pictures above, because the bargains I received were staggering. I bought a beautiful gray silk tie with small dark gray Christmas trees on it for my husband. This tie retailed for $20.00, but was on CLEARANCE for only $8.00. I bought a hardcover children's book, "The Ugly Duckling", for my daughter, which retailed for $10.00, but was on CLEARANCE for $2.00. For myself, I not only found a complete workout outfit, I was even able to get both a tank and a long-sleeve shirt, which matched the knit pants I found. 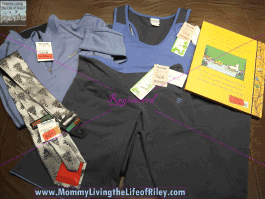 So, to sum it up, I purchased a jacket, pair of yoga pants, matching workout tank, long-sleeve exercise shirt, hardcover children's book and silk tie for only $86.97! If I would have paid the original department store prices, this same merchandise would have cost me $292.00. If you're looking for quality name brand products, without the name brand prices, then run to T.J. Maxx or Marshalls and shop 'til you drop! 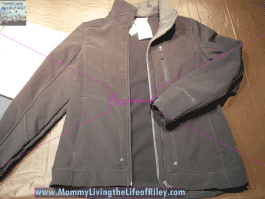 What tips do you have for purchasing name brand items for less? Disclosure: I received a T.J. Maxx/Marshalls gift card in order to facilitate my review. No other compensation was received. This product review is based on my own personal experiences with this item and is completely honest and objective. I have found some great deals at Marshall’s before as well. It does take some patience, though.